Attractive location, still close to centre. Private rent: country house (210 sq m) and garden (600 sq m) rent. Fully equipped for careless family holiday time. Free fast WIFI - house and garden area. International channels - big screen TV. Secure, fenced, lightened garden with children swing set & trampoline. Only green meadows behind garden - direct view on Triglav, Julian alps. Full owner assistance, help & tourist information. Living room, kitchen, sport equipment storage. Stoned barbecue / grill - wood included. Close to lake, river, bycicle tracks, national park, tracking paths, sports offers, ski centers, fishing activity. Center nearby offers: supermarket, local market, health centre, pharmacy, bank, police, post office, many bars & restaurants. For high seasson, You can choose July and August, but less crowded and most beautiful months in Bohinj are June and September. In a hearth of a safe and peaceful countryside of Slovenia. Traditional country house with garden on attractive location, at the edge of a nice village, where countryside meets endless green fields. Behind the house is a large, quiet private fenced garden, with great shadows of apple trees, where you can enjoy breathtaking views on a Triglav and other beautiful mountains. Children can enjoy playground and large trampoline. Extra comfort you can find in a spacious glassed porch with large table. With house, our guests use private, secured & lightened parking space. Extensive house equipment brings you a careless all season holiday time. 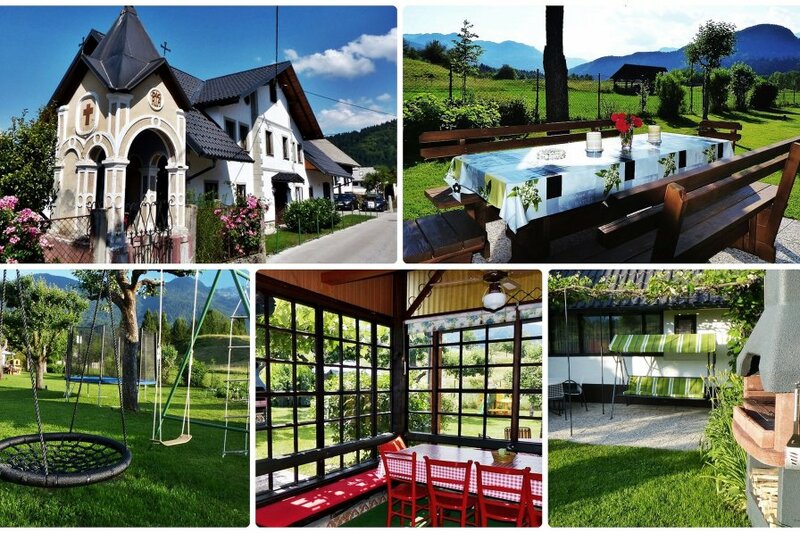 Owner nextdoor provides all info, help and assistance.House Zotlar Bohinj - size 210 m2 - separate unit - private entrance - quiet location. House include two floors. At the ground floor there is a hallway with sport equipment drying space, living room (international digital cable flat TV), kitchen with dining suite, bathroom, toilet and porch with exit on terrace and private garden size 600 m2. First floor contains bedrooms, arranged around multi-purpose hall, toilet and second bathroom. House is equipped in traditional style, centraly heated during winter and naturally climatizated in the summer months. Fast WIFI in complete house and garden area. Fully equipped for careless holiday time. Bohinj is one of the most beautiful places in the heart of the Julian Alps and in Triglav National Park. Ski resort, mountain resort, aqua park, lake, river fishing, kayak, canoe, surfing, hiking, cycling track. Beautiful mountain views from garden, just medows/green fields behind house - accessible direct from garden. View on highest mountain in Slovenia - Triglav.